A federal bankruptcy court judge in Delaware, Kevin Carey, called the price adequate and the process rigorous. Several potential buyers emerged in the past week after the bankruptcy trustee recommended the sale be made to FPI. The judge did not allow an auction Tuesday. “Anyone who wanted the opportunity to bid had it,” he said. FPI wants to keep the Hard Rock brand but has agreed to destroy any Hard Rock-branded merchandise before the park opens if there is no agreement on extending the license contract, lawyers for the companies said in court. The park’s original owners had paid $2.5 million annually to use the brand. The judge overruled the objection of Coastal Entertainment, a company out of Finland that said it wanted to bid $25.5 million. Officials with legal and accounting firms involved in the case said it would take at least 10 to 14 days for the company’s funding to come through to the United States, and they could not confirm a claim by the company that it had wired in a down payment of $2.5 million. FPI has said it would take about three months to get the park ready, including adding rides, arranging merchandising and designing new attractions and shows. The new owners include representatives of Baker Leisure Group, an Orlando-based theme park management company that plans to manage the park’s daily operations. “We’re absolutely thrilled with the bankruptcy court’s decision [Tuesday], and we look forward to opening the park in the May timeframe,” David Wasson, a principal with FPI MB Entertainment, said as he left the hearing Tuesday. While exact specifics of the deal have yet to be revealed, it is apparently an all cash deal. There could be changes made to the park even if it does keep the Hard Rock name, but the Baker Leisure Group is working out those details, Duncan said. He also said people would likely be “happier” with the admission price when it reopens. Tickets last year were $50. The $400 million Hard Rock Park opened in April of last year and just after one operating season, closed and filed for bankruptcy in September. Failing to find a buyer, the owners asked a Delaware bankruptcy court in January of this year for permission to liquidate, signaling once and for all that it will not be able to reopen. However, it seems as though hard Rock park will rock on. 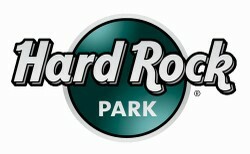 What is yet to be determined is if it will continue to be called “Hard Rock Park,” maintain its “rock n’ roll” theming and/or survive in the hands of of new owners.